Description: The Mickey Mouse Xylo is a one-year-only pull toy that was sold exclusively at Sears and Roebuck. This Xylo is the very last Disney pull toy made by Fisher-Price. The toy has Mickey Mouse dressed in a brightly colored band uniform sitting in front of a 3-key xylophone. When pulled, the xylophone base pivots from side to side while Mickey strikes the keys with his mallots. FPT4337 - Wooden cut-out Mickey Mouse figure with paper lithographs on both sides of Mickey Mouse wearing a tall red band hat, a red band jacket with yellow trim, blue pants with a white stripe down the side, and black boots. Mickey has 2 wooden cut-out arms with paper lithographs on the sides of red sleeves and white hands. There is a round Mickey Mouse Club logo on the sleeve. Each arm has an attached mallot on the end with a red bead on the end. Mickey is sitting in front of a round white wooden platform that has 3 different colored metal xylophone keys on top (large blue key, medium yellow key, and small red key). 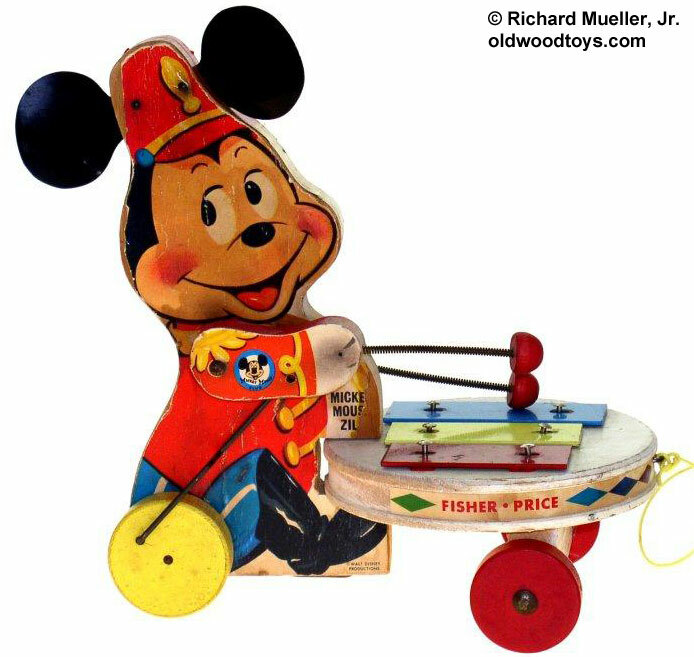 The toy rolls on 4 wooden wheels: 2 under the xylophone platform and 2 under Mickey Mouse. When pulled, the xylohpone base pivots from side to side while Mickey swings his arms and strikes the xylophone keys with his mallots. Sold only at Sears and Roebucks.